To create an Access database, you need to first create a database table and then define the names of all the fields you want to store in that table. Access database tables let you divide a file into separate parts. For example, one database table may hold the names and addresses of all your customers, a second database table may hold the names and addresses of all your employees, and a third database table may hold the names and addresses of your suppliers. Access stores all this related information in a single Access file that’s saved on your hard drive. To design your Access database, you can create a database from scratch or use an existing template, which you can modify. Designing a database means defining both the number of fields to use for storing information and the maximum amount of data each field can hold. If you have a field that stores numbers, what are the maximum and minimum limits on the numbers you want to save in that field? If you’re storing someone’s age, you probably don’t want the field to contain negative numbers or numbers beyond 200. If your field needs to hold salaries, the field may need to hold large numbers but no negative numbers. 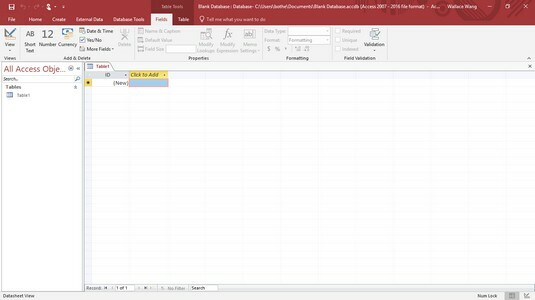 Access can create a blank database or a special database by using one of many templates available from the Microsoft website. No matter how you create a database, you will likely need to customize it for the type of data you want to store. When you start Access, it gives you a choice of opening an existing database or creating a new one. Access displays a variety of database templates you can use. 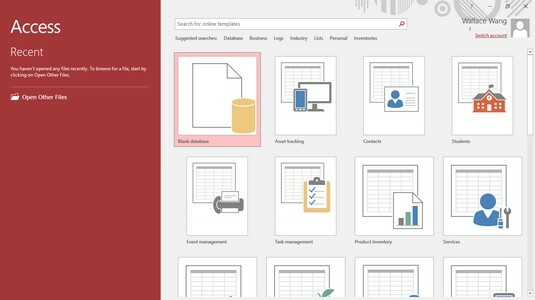 Click an icon, such as Blank Database, or any database template. When you click a template, a window appears; you see a preview of your template. Click in the File Name text box and type a descriptive name for your database. If you click the folder icon that appears to the right of the File Name text box, you can open a dialog box that will let you define a specific drive and folder in which to store your database file. Click the Create button to create your database file. Access displays a blank database. Click the Click to Add heading. Access displays a menu for defining what type of data that field can hold, such as text or numbers. The Click to Add column heading displays a menu of different options. Access displays a generic field name, such as Field1. Type a name for your field (such as First Name or Salary). Access displays another Click to Add column; its menu lets you choose the type of data to store in the next field. Choose Long Text or any other data type you want the field to hold. Access displays another generic field, such as Field1. Type a name for your field, such as Last Name. Repeat Steps 9 through 11 for each additional field you want to create. When you have finished adding fields, press Esc on the keyboard. Check here for handy Access 2019 keyboard shortcuts.